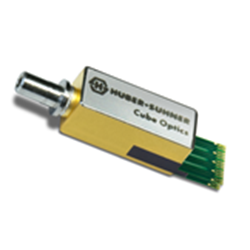 HUBER+SUHNER offers a new ultra-compact, integrated PAM4 Receiver Optical Sub-Assembly (ROSA) designed for compatibility with 200GBase-LR4 and 400GBase-FR8 transceivers. Yielding superior performance in a robust and reliable design, the multi-lambda 200 Gbps ROSA sets the standard for the next-generation of pluggable transceivers in data center and LAN applications. The ROSA comprises an optical de-multiplexer, integrated four PIN detectors, and an array quad Trans-Impedance Amplifier (TIA) of extreme linearity supporting the PAM4 modulation format. It receives four optically multiplexed signals over a single fiber utilizing the 1295.56, 1300.05, 1304.58, 1309.14 nm channels of the LAN WDM IEEE grid, each propagating at 28 GBdps. The core optical element draws on Cube Optics’ intellectual property and the company's fabrication expertise. For more in-depth information on the HUBER+SUHNER ROSA, visit the webpage.